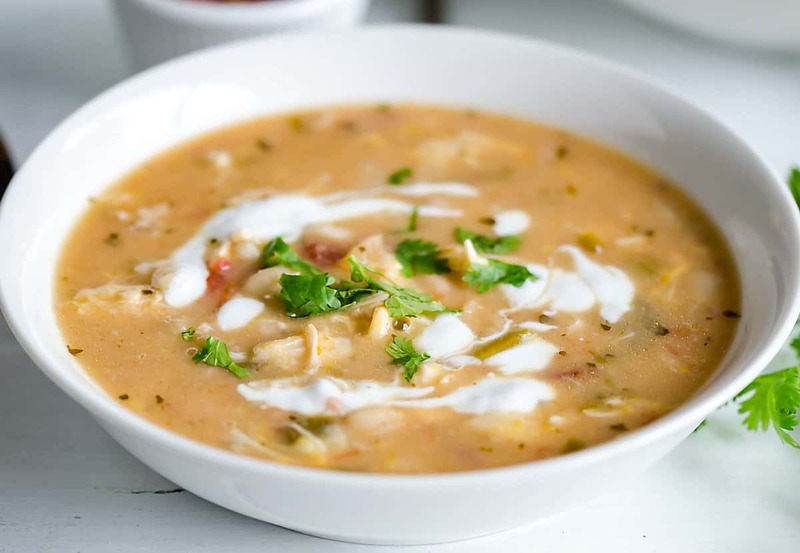 You won’t be able to resist this White Chicken Chili ~ Tender chunks of chicken, creamy white beans, cheesy broth, and just the right amount of heat. It’s the easiest chili recipe you’ll ever make! Breakout that crock pot! Update: I just recently updated the photos in this post~ Enjoy!! 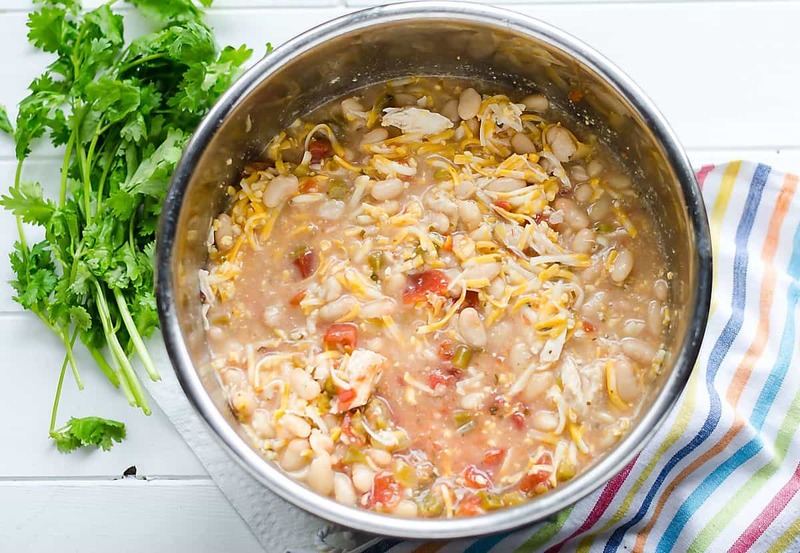 Seriously, this white chicken chili is the easiest chili recipe ever!! And it tastes ah-mazing. I know, that word is overused, but I had to say it, it’s chili heaven right here! If you’ve been reading my blog for anytime at all, you know I really do enjoy being in the kitchen. I enjoy the whole process of a meal coming together. I don’t mind slicing and dicing and stirring and creating. 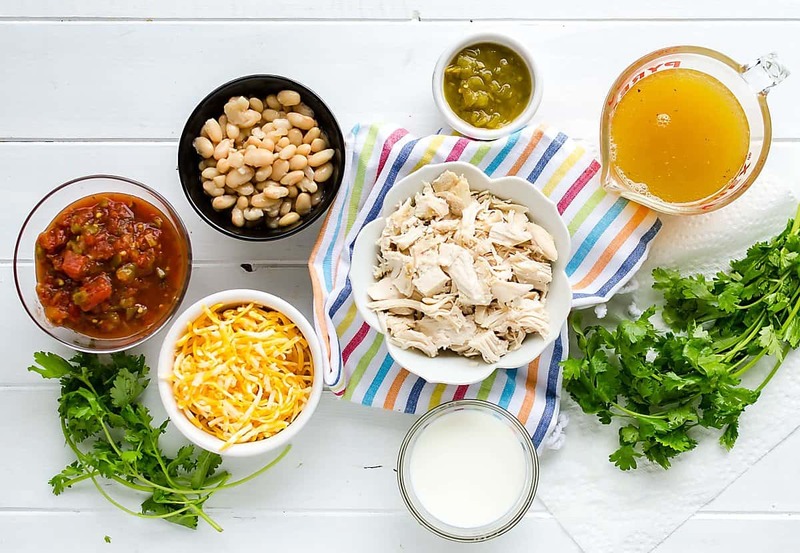 I actually have a couple chili recipes that call for that: This Healthy Turkey chili is ultra fresh. And, since having an instant pot, I love this Turkey Chili with Butternut Squash, because it cuts down on cleaning. However, we all need a dump and run kind of a recipe now and then. Sometimes more often than that! I’m crazy for my crock pot. I even use it in the summer. As much as I don’t mind preparing meals that take a little longer, with four children running around, it can be challenging at times. This is an awesome easy chili recipe passed on to me from “Mom Dyk”. Mom Dyk is my husbands 2nd mom so to speak. When he moved here from the other side of the state and became friends with her son Scott, she took him in too. He doesn’t have any family in the area, so he ate Sunday dinners there, and holidays, etc. Once we met, she let me into the circle too. 🙂 I love this recipe because you really just put it all together and let it go in the crock pot. I now call this “award winning” because it recently won a chili cook-off! I really couldn’t believe it! If I was trying to win, I would have done some super special chili with a secret ingredient, but it was a fundraiser for church. Not that I didn’t want to win, I just never expected it with this easy of a recipe! Everyone got to eat lots of chili, and then pay to vote for their favorite. I was shocked! That tells you how good this recipe is!! I hope you enjoy this one as much as I do. The only prep for this recipe is cooking the chicken before hand. I like to poach chicken, it keeps it really tender. But, you can go super cheater style (like I do sometimes) and just grab a rotisserie chicken and cut it up. Whether you cook your own chicken or purchase a rotisserie one, prep it the night before so you can dump and go in the morning. P.S. For more recipe inspiration, follow me on Pinterest and Facebook. Like behind the scenes action? Check out my stories on Instagram. 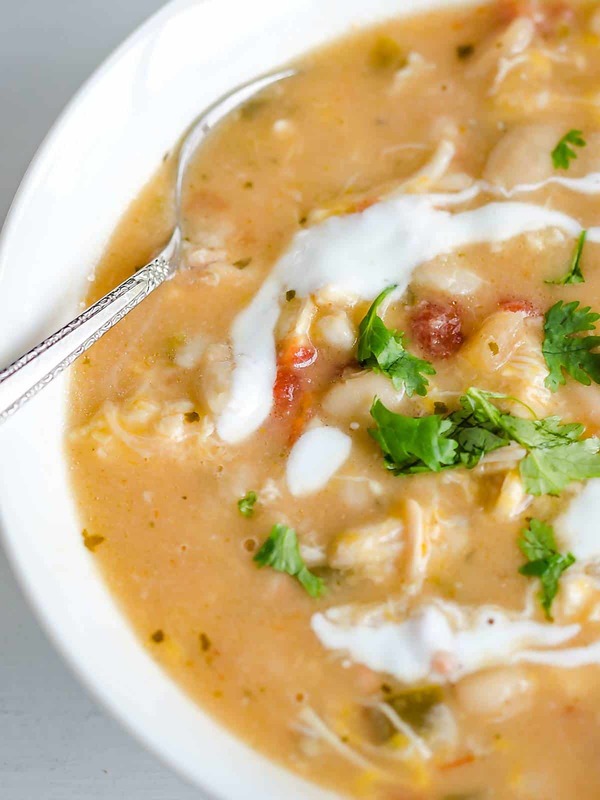 Tender chunks of chicken, creamy white beans, cheesy broth, and just the right amount of heat. 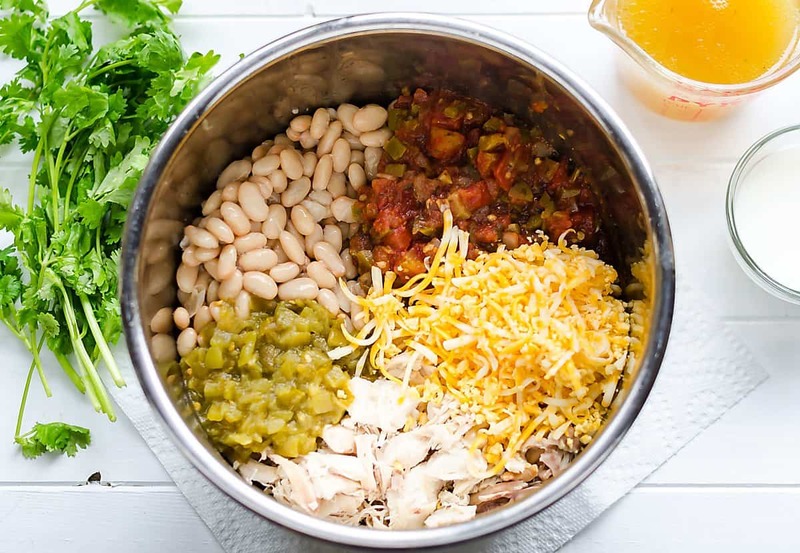 It's the easiest chili recipe you'll ever make! Breakout that crock pot! 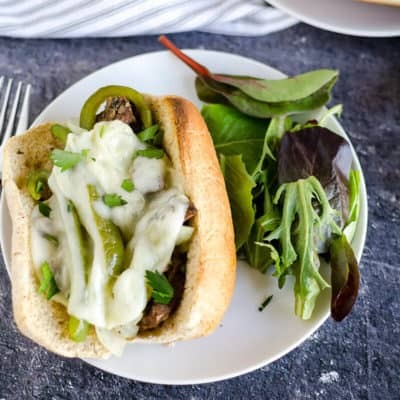 Place all ingredients except sour cream and cilantro, in a slow cooker. Cook on low for 6-8 hours, or on high for 3-4 hours. 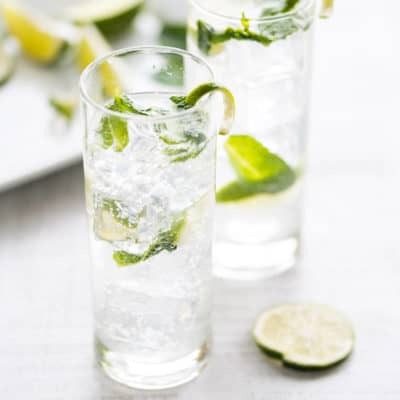 Garnish with sour cream and cilantro. What about YOU?? Please share your favorite chili recipe in the comments! Yum! I love Chicken Chili .. I will be making this recipe. Love the combo of chicken and green chilies..it is the base for my chicken enchiladas. Looks like a great reason to get a crock pot! Horace! You don’t have a crockpot?? 🙂 Yes, get one. Even though you could still do this on the stove top. If I had to eat one thing everyday, it for sure would be mexican. Love enchiladas too! This recipe looks wonderful. My family loves chili. Stopping by from Tasty Tuesday. Pinned! 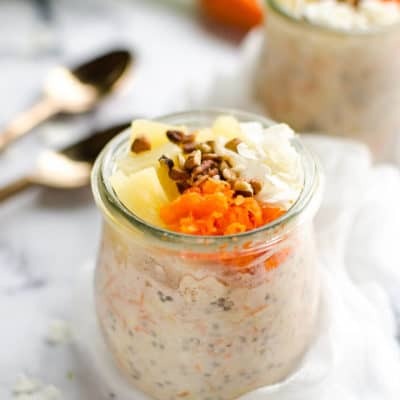 Thank you for stopping by and pinning my recipe! Don’t you just love pinterest? It’s my go to for searching things these days. 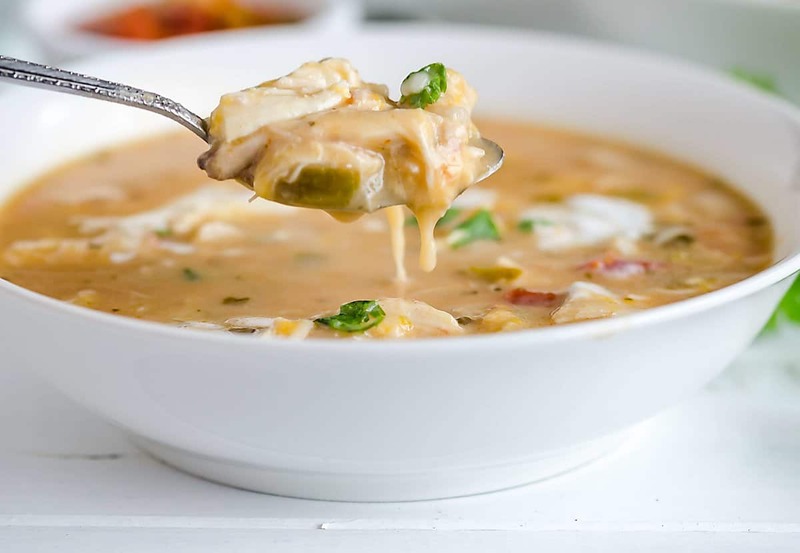 I love White Chicken Chili and it is perfect for Fall. Thanks for sharing on Creative K Kids Tasty Tuesdays. I hope you will join us next week. Thank you Audrey! I really enjoy your link party! In the description, I noticed that cumin was mentioned as one of the ingredients. When I was looking at the ingredients listed, it does not list cumin or how much. This recipe looks great and I am anxious to try it. Connie, thank you so much for pointing this out! I obviously missed an ingredient. It’s fixed now. It calls for 1 tsp, but I usually add a little extra because I really like the flavor of cumin. Thanks for sharing your recipe! I am making it for to ight’s dinner. I decided to add 2 cans of Green Giant White Shoepeg Corn. 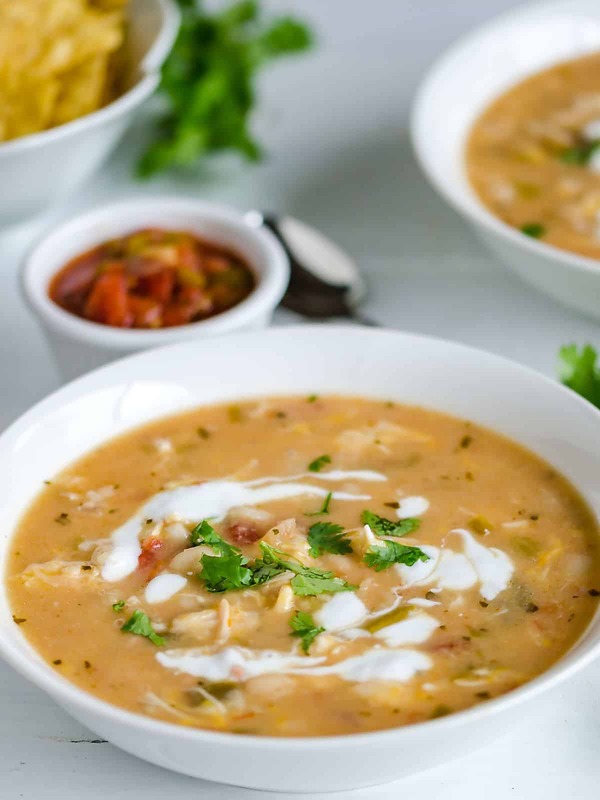 I used this in a different white chicken chili recipe and we really enjoyed the addition! I love that idea! Thanks for sharing, I will try that the next time I make it. I do have other chili recipes that I use corn in, but I’ve never thought about it with this one, especially white shoepeg corn, I’ll have to look into that. This looks so delicious! 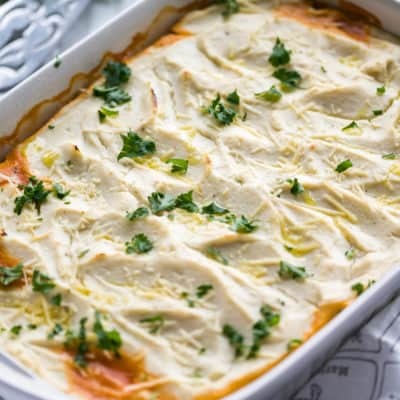 A great dish anytime but especially on a chilly day! Oh I love the story behind this yummy chili and your husband’s 2nd mom. This deliciousness is killing me! 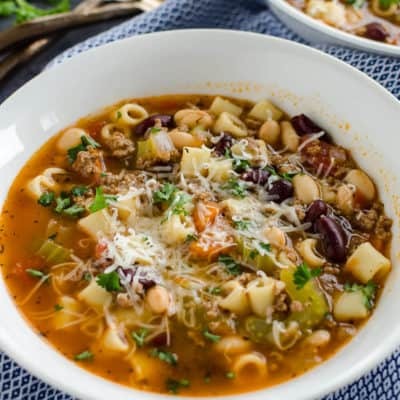 Looks SO darn good- such a good twist on your typical chili recipe! Sounds yummy. Not sure if I trust the Nutrition Facts though.. 0 Fiber?? I have no idea what cheese to use?